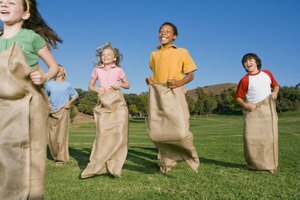 Group gross motor activities can help students develop healthy bodies and minds. Physical education is a school subject that should be fun and exciting for children. In addition to teaching healthy habits and promoting a non-sedentary lifestyle, physical education classes can help students develop and refine their gross motor skills using games and group lessons. Locomotor movement, spatial awareness, object manipulation and rhythm are all important lessons for elementary school students, and group activities can help them develop these skills while nurturing communication, teamwork and self-esteem. A simple game of "Follow the Leader" can nurture locomotor skills, such as running, hopping, skipping, jumping and galloping. Have a child pick a card with a locomotor movement written on it and perform the movement for the rest of the group. The other children should follow behind him, circling around the gym area. Blow a whistle when it is time for the children to stop, then start the game over with another leader and a different locomotor movement. Rhythm, spatial awareness, relationships to body parts and non-locomotor movements (such as balance) are all part of the art of dancing. Line the children up and pick an upbeat, kid-friendly song. Teach them how to step from side to side and front to back, and how to bounce up and down. Have them point their foot forward, to the side and to the back while holding hands, and switch sides. Younger elementary school students could play a round of the "Hokey-Pokey," and you could lead older elementary school students in a square dancing unit, which requires at least four pairs of dancers who will switch partners several times throughout the dance. A relay race is an effective way to pull all gross motor skills together in one game. Set up a identical obstacles side-by-side in your gym area. These obstacles might include cones to run around, balance beams to walk across, bean bags to throw and potato sacks to wear while jumping toward the finish line. Set up two teams and encourage one child at a time to go through the course. When that child is finished, the next team member must complete the obstacles. If you have a younger group of children, make sure to help them through each challenge as needed to avoid frustration. Manipulating an object, such as a ball, bean bag or balloon, is an important part of gross motor development. Gather a group of children in a circle. Give one child an object, and ask him throw it to another person while saying their name out loud. Continue this game until everyone has had a turn. You can also encourage the children to pass the object in various ways, such as throwing underhand, overhand, kicking or rolling. Activities using a parachute refine spatial awareness. A parachute game can teach elementary students about general directions (such as up and down), as well as about controlled movements. Using a parachute can also encourage the children to work together to achieve a common goal. Have each child grab two handles of the parachute. Slowly lift the parachute up by having the children raise their arms. Squat on the floor to bring the parachute down to the ground. Have the children pull the parachute taut, make it gently wave or "pop" it with quick movements. Have them walk to the right together, and then to the left. You can place several bean bags in the middle of the parachute so the children have an object to manipulate as they work together to move the parachute. 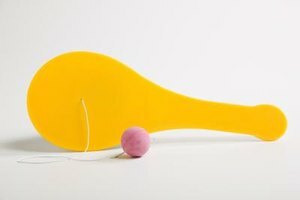 Activities for Gross Motor Skills Development; Teacher Created Resources, Inc.
K., Ashley. 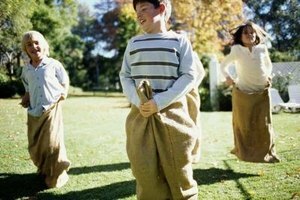 "Gross Motor Group Ideas for Elementary School Children." Synonym, https://classroom.synonym.com/gross-motor-group-ideas-elementary-school-children-28186.html. 26 September 2017.